Work Capsule Wardrobe: Spring Trends | Finding delight. I’m a big believer in the idea that finding ways to eliminate decision fatigue can increase your quality life, eliminate stress, and allow you to focus on the things that truly make you happy. One of my favorite hacks for cutting back on decision fatigue? The work capsule wardrobe. Did you know many of the most successful folk wear the same clothes over and over again. While you may not want to rock jeans and a turtleneck to the office every single day (a la Steve Jobs), reducing your wardrobe will make it a heck of a lot easier to answer “What am I gonna wear today?” every morning. 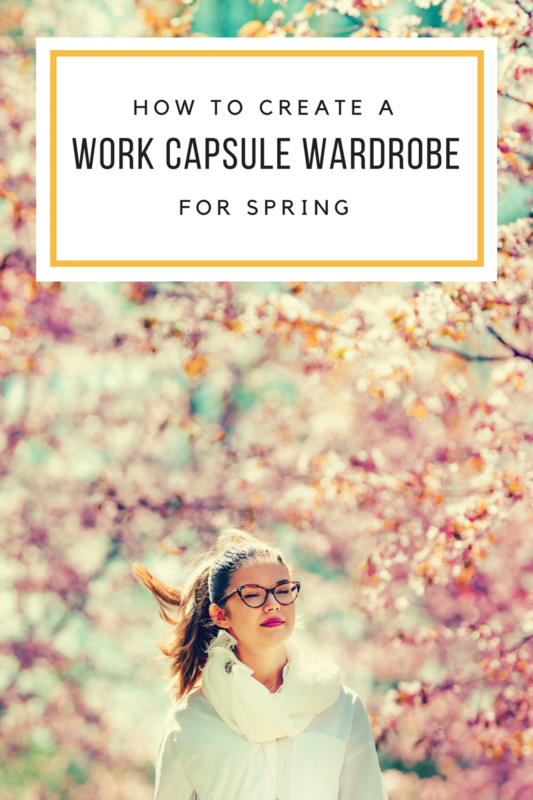 With this in mind, I thought I’d share a really simple method for putting together a seasonal capsule wardrobe for work! Since Spring is on the horizon, we’ll start there. Let’s go! First, you want to establish your core pieces. These can change from season to season or remain the same all year long. Either way, these items create the base for your work capsule wardrobe. Next, you want to look for inspiration. Scour your favorite fashion mags, blogs, and Pinterest boards to get an idea of looks you might want to include in your capsule for the season. Identify about 5 trends. For Spring 2018, the fashion trends I’m loving are: FLORAL COATS, PASTEL MULES, PINK DRESSES, TIE BLOUSES, and WRAP SKIRTS. Finally, you want to gather trend items to build out your wardrobe. After you’ve found your favorite trends of the season, you’ll add wardrobe pieces to reflect them. Add 1-3 pieces for each trend (depending on how minimal you want to be). There are multiple ways to do this. Let’s use the trends listed above as an example. 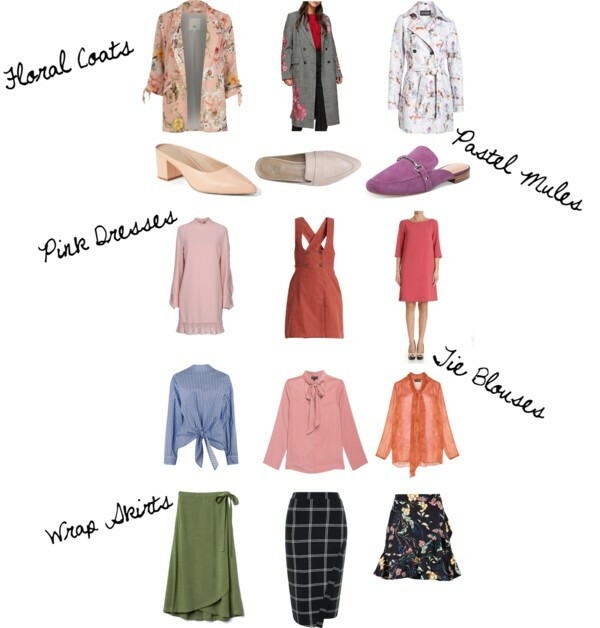 To incorporate your fave spring trends you might pull a wrap skirt and a tie blouse out of the “warm weather clothing” storage tucked in a bin under your bed, hit your local thrift shop to find a new-to-you pink dress, and splurge on a pair of pastel mules and a floral blazer. There’s no need to buy a ton of trendy items — find ways to incorporate the looks of the season without spending a fortune! Oooh I love these! Absolutely loving all in the first collage. I absolutely love all the pieces you’ve chosen – there’s not a single I wouldn’t wear in the first capsule! I need to make a list of this right away and get organised! That’s a great idea! 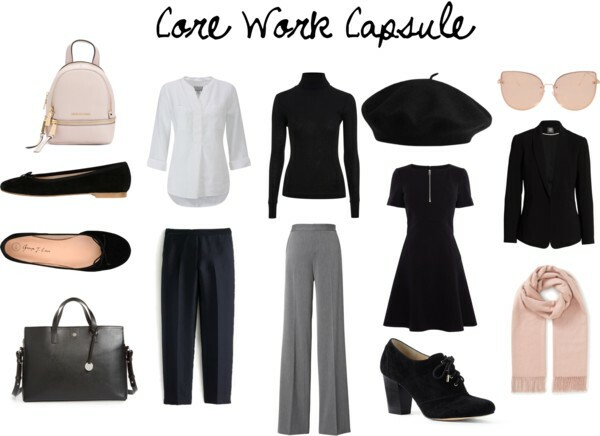 I love the work wear capsule, every piece is wearable and I could mix and style them very easy. Well done! It is definitely helpful and time-saving to have such capsule wardrobes. The question of what to wear today really bugs me and I think this is an amazing way to be organized. I love wardrobe capsules! These are especially handy for traveling! I need to perfect the art. I don’t have a large closet, but I still have far more than I want to go through to figure out what to wear everyday. I always love your fashion post and wardrobes!! They look great and so pretty!! Pingback: Spring into Style with a Fashion Refresh! | Finding delight. Pingback: Email Marketing Do’s & Don’ts | Finding delight.